This will most probably be the last Go-Geo! Blog post of 2010. I thought i would continue with the winter theme by pointing out a couple of nice wintry cartograms. First up is Wintry Britain by Benjamin Hennig of the University of Sheffield. 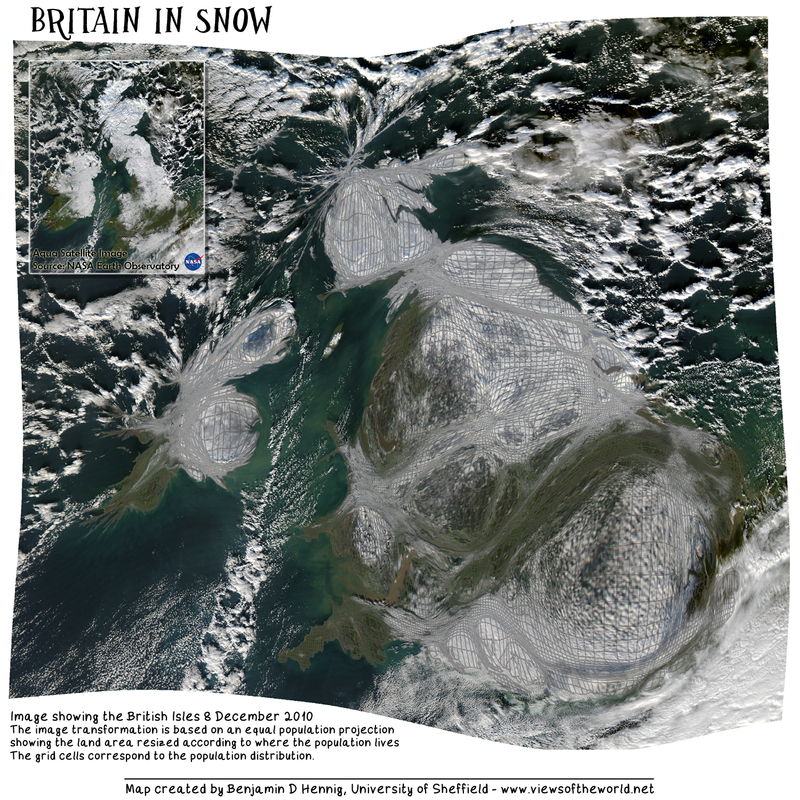 What Ben has done is to take an Aqua Satellite image from NASA’s Earth Observatory The image clearly shows that all but the south-west of the UK has been plastered with snow. But what the raw image doesn’t show is the percentage of the population that this may affect. To address this, Ben has reprojected the image using the gridded equal-population projection which transforms the picture according to the population distribution. The resulting image looks skewed but it shows where people live. So the effect of having snow in the midlands and the South-East is massive due to the number of people living in these regions. The second cartogram has been produced by Daniel Lewis of UCL and uses a similar image from Neodaas at The University of Dundee. Dan drew inspiration from Ben’s cartogram but decided to investigate the number of households with, or without, central heating. The more households with central heating the smaller the area will be represented in the cartogram. This reveals that the majority of homes in the North of England and Scotland have central heating. I suppose this is no surprise there. Dan points out that the midlands and the south-east have a large number of households living without central heating. This could be as a result of complacency to harsh winter weather or larger numbers of sub-standard housing. I think that both of these cartograms are excellent and usefully represent data with a spatial context. The addition of the satellite images as backgrounds just adds to this. This entry was posted in Remote Sensing, Uncategorized and tagged 2010, cartogram, remote sensing, Snow, UK. Bookmark the permalink.